To make people more aware of their living environment, the WIRE's design is inspired by the people's "way of thinking." Usually, from the moment people see an object with their eyes and send the information to their brains, a little gap called optical illusion, is created. 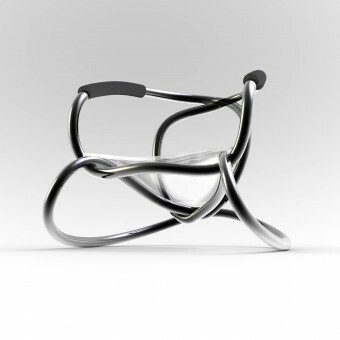 The Wire utilizes this illusion between looking and thinking to create a furniture piece that has both 2d and 3d features. When people look at the chair from different directions, it always looks different, as if moving a 2d wire in a 3 dimensional living space. Using the CNC rolling technique, WIRE is formed by two pieces of aluminum tubes. 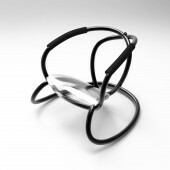 Even though it’s a functional chair, it looks like wires hanging in a flat surface. The seating space is hidden in the pipes. The chair has a unique structure with very good self-balance. It is a durable, stable and sustainable piece with low material cost and luxury appearance. WIRE is easily manufactured. Also, the light weight and rust resistant materials make it good for outdoor and indoor using. It is a light-weight, and low-cost furniture. The unique structure won’t block your eyes from looking at every corner of your room. It is also a durable, long-lasting piece. It can be easily brought outdoors and you don't have to worry about it rusting, breaking, or getting dirty. It shows a variety of shapes depending on the location of the viewer. This concise, modern and luxurious-looking chair is a great option for your living room. The project started in March 2012 and finished in May 2012 in US. Anodized aluminum pipes, 1 plastic X connector and a piece of formed acrylic sheet. 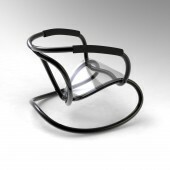 Wire Rocking Chair by Hong Zhu is a Nominee in Furniture, Decorative Items and Homeware Design Category. · Click here to register today inorder to be able to view the profile and other works by Hong Zhu when results are announced. 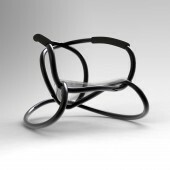 Wire Rocking Chair by Hong Zhu is Winner in Furniture, Decorative Items and Homeware Design Category, 2012 - 2013. · Read the interview with designer Hong Zhu for design Wire here. · Press Members: Login or Register to request an exclusive interview with Hong Zhu. · Click here to register inorder to view the profile and other works by Hong Zhu. Did you like Hong Zhu's Furniture Design? 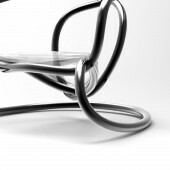 Did you like Wire Rocking Chair? Help us create a global awareness for good furniture design worldwide. Show your support for Hong Zhu, the creator of great furniture design by gifting them a nomination ticket so that we could promote more of their great furniture designs.